How to Catch Big Bluegill. Exciting Bluegill Tips and Tricks! It's time to learn how to catch really big bluegills! Bluegills so big you'll need a camera and maybe a net! 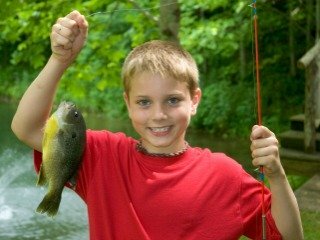 There are also some great tips and tricks here that you can use to catch five to ten times as many bluegills and bream of all sizes. 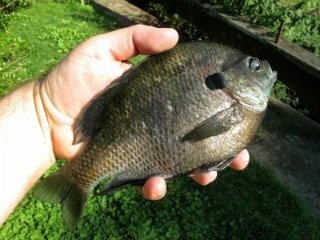 We'll take a glance at other sunfish species, and I'll share some overlooked spots where you can go bluegill fishing. Finally, I'll wrap it all up with some key tips. Right now, let's get started. Catching the really BIG ONES: Ten Inches and Up! If you've read my first page about bluegill fishing, you'll know where to look for big bluegills in every season. If you haven't got a chance to read it yet, please check out the bluegill fishing page first. Then you can come back and be ready to start here. The biggest bluegills come from bodies of water with very small populations of bluegills and similar panfish. This means that the few bluegills in there get a LOT to eat, so they grow to be huge. Southern latitudes are more likely to produce giant bluegills than Northern regions. Bluegills eat a lot more in warm water, and summers are longer in the South. However, you can still catch whoppers Up North if you go about it the right way. Wherever you fish, it will take some research on your part to find trophy bluegill waters. This can be done by contacting state fisheries agencies, talking to local anglers, examining pictures at bait shops, and talking to pond owners. When you've put all this information together, you'll have a good idea where the big bluegill live in your area. Then you can plan on fishing for them at peak times of the year. I recommend giving it a shot at spawning time. Big bluegills spawn deeper than small ones, so it can pay to fish deeper than usual. The deep edges of spawning colonies hold the bigger fish. Midsummer is a good time to target big bluegill, because they're eating a lot due to warm water temperatures. The biggest fish may live deeper than the "keepers," so 30 ft. deep and more is not off-limits. For these big bluegill, it's a good idea to use somewhat larger baits than you would for normal bluegill fishing. Good-sized leeches, multiple small worms, or a sizable grasshopper are more likely to catch pie-pan-sized fish than the typical offerings. Small minnows are also a possibility as bait. The periods right at ice-up and right before ice-out are top bets in winter. These are times to scale back to small baits. 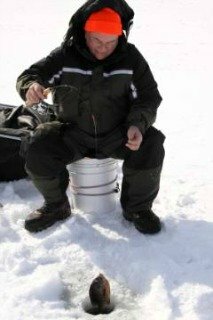 Your good research will turn up more dates and seasons when lots of big fish are caught. These are other key times to add to your fishing calendar. Taking notes from year to year about your own experiences also helps identify seasonal patterns. For instance, I have a friend who targets big northern pike at a certain time in January every winter. His notes from prior years showed a clear pattern. It's no surprise his picture is on the wall of the nearest bait shop! Fully exploring the Internet will also give you some great ideas and tips. This is a great article about big bluegill and what it takes to grow them, plus it gives more advice on finding the right waters to fish. It can be very tough to find and catch trophy bluegill. A really big bluegill tends to be a lone fish or may be a member of a small group. Big bluegills won't be in the typical schools of 20 to 30 fish, like small ones. Catching a bull bluegill will require patience and persistence, as with any trophy fish. When you catch a big bluegill weighing a pound or more, it may not look like what you expect. As a big bluegill grows past ten inches, its face usually becomes somewhat flat. The fish may not be shaped like the normal sunfish profile. Its mouth may seem to open from a flat head. While it may look a bit gross and unusual, you'll have a really big bluegill to be proud of. The world record bluegill weighed 4 pounds, twelve ounces. It was caught in a small pond in Birmingham, AL. The record has stood since 1950. Here's an article about the record. It also tells about the hard luck of the guy who came in second place. What a loser! There are two bluegill fishing tips you can use that will drastically increase your success for all sizes of bluegills. When bluegill fishing, it's best to use four-pound-test line in most situations. Bluegills have incredible eyesight and can see fishing line. 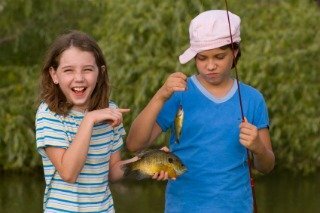 Big bluegill aren't dumb like the little ones; they reject baits that seem suspicious. Big bluegills got big by being cautious and smart, and they prefer to stay alive! Knowing this, some anglers go a step further and use two-pound-test line. This is a smart move when you're targeting trophy fish that are wary. It also helps when bluegills are picky, and in clear water where line is more visible. You'll get far more bites on small diameter line. But a big bluegill will break your line if you lift him out of the water. The best thing to do is to net the big bluegill instead. It's no fun when a trophy bluegill gets away. You need a tougher line around trees, brush, and thick weeds, in case a fish tangles you up. Still, you don't want the bluegills to see it. A strong fluorocarbon line is a good option for these areas, because it's invisible underwater. The second key is to learn to fly-fish. 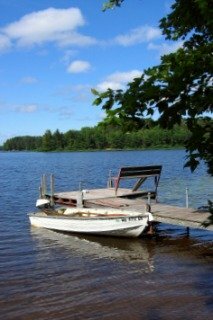 Then, as you're on the water, you'll want to watch for bluegills and bream feeding on the surface. They do this during insect hatches. In calm water, you'll see circular ripples on the surface where the fish are coming up to slurp in these bugs. When that happens, it's time to pull out the fly gear and go after 'em. Wow! What a difference a fly presentation can make! Many of these are very pretty fish and they're fun to catch as well. 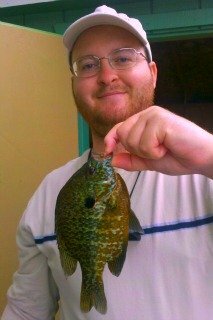 For instance, I was happy to catch the colorful pumpkinseed sunfish pictured here. It measured eight and three-quarters inches long. You can often catch these other species using the same baits and lures that you use for bluegill and bream fishing. However, there are some differences between bluegills and these species, such as their preferred foods and typical locations. Most people go bluegill fishing in lakes, reservoirs, and large rivers. Other places that should be considered are streams and small rivers. Even little streams can provide outstanding action. One time my brother and I had a blast catching bluegills in a small Texas stream. Most people wouldn't have fished there, but we tried it and got bite after bite. A point to remember about rivers and streams is to fish in areas of slack water and pools. You'll have best success in places where the current is broken or slow. The fish don't usually live in runs, riffles, or fast-flowing water. One of the best bluegill fishing tips I can give you is to fish for bluegill and bream in the right ponds. The key is to pick ponds that also have a predator species like largemouth bass; if there are not enough predators, the pond produces tons of small bluegills. The trouble is that there isn't enough food for all of them. The pond gets full of stunted four-inch fish. I've fished in lousy ponds and it's pathetic, no matter how many dozen four-inchers I catch! But with permission to fish the right pond, you can catch exceptional bluegills. One of the biggest and prettiest bluegills I ever caught came from my neighbor's pond. Fish location depends on the size and depth of the pond. If the pond is big and deep enough, the fish could follow a seasonal pattern similar to that in natural lakes. Most ponds are rather small though. In these, areas with cover such as weeds, brush, or fallen trees are good. Shady spots are also top choices. A combination of both cover and shade is even better, especially in summer. Fish will often hang along the edges of ponds. I've generally done better along the edges than out in the middle. However, bluegills can choose the deepest areas in mid-summer when the weather's really hot. Generally with a pond, the advantage is on your side. The fish have less space to roam around in ponds than in large lakes and rivers. This makes bluegills easier to find. There are other fishing spots that people don't notice. I've fished for panfish and gar in drainage ditches in South Florida. They're odd places to fish, but I could see fish in them so I gave it a shot. Speaking of Florida, the state has canals that are loaded with fish, and these are worth trying. They're also full of alligators! 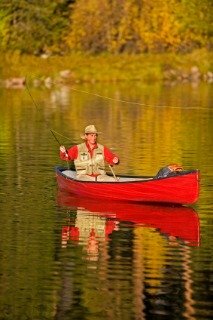 Streams, rivers, ponds, and canals can often be fished without a boat. If you don't have a boat or don't want to bother launching one, these places are all good bluegill fishing options. A good trick is to use a spinner blade and beads placed on the line right in front of a baited hook. I usually use nightcrawler portions for bait. The idea is to cast it out in various directions and slowly reel the rig in. Doing this can help you find a school of fish more quickly. Sometimes I'll attach a bobber to my line above the rig. When I cast the rig out, I let it sit still a minute after it hits the water. If there are no bites, I slowly reel in ten or twenty feet of line. Then I let it sit still once more, waiting for any followers to bite. The spinner and beads get the bluegills' attention. They'll often follow it, and then inspect the bait as it sits still. Once they decide they want it, they bite. You can experiment with different color blades and beads to find what the fish like best. I would start by trying bright, flashy blade colors such as hammered nickel or chartreuse. You throw small pieces of bread in the water to attract any bluegills in an area. Other items to try are Corn Flakes cereal, crushed potato chips, and ground up cat or dog food. This method of chumming is easily done standing on a dock, but it can be done from shore or an anchored boat as well. If the bluegills are aggressive, competitive, or just plain stupid, they'll come grab the food off the surface. If they're more wary and smart, they'll wait until it sinks in the water before eating it. While bluegills are eating the chum, you toss in a hook baited with a worm or cricket. Bread will work if you can get it to stay on the hook. The plan is to attract the fish to you with the free stuff, then catch them while they're off guard and feeding like crazy. It is possible to get the fish conditioned to expect food at a certain time and place every day. For instance,you can walk out on a dock when the sun is directly overhead every afternoon and start chumming. After a while, the fish will grow accustomed to this free meal each day. They may even come to recognize you and grow comfortable with you being overhead. It will soon be time to drop a line in, catch these bluegills, and fry them up! It is absolutely essential to remember that most big bluegills don't live in the shallows during the summertime. Rather, they are out along deep weededges, using cover in 10-20 ft. of water or even deeper. Although bluegill fillets are generally not available at grocery stores, you may be able to order them online. If you don't want to clean fish, this could be a great solution for you. Once bluegills get past the nine-inch range, it's time to practice conservation and let most of them go. This gives a big bluegill the chance to become a trophy. It's better to keep some fish between seven and nine inches long for the table.